Welcome to the page for Spondon in Bloom. You can find information from previous years here. The Sensory Garden on Chapel Street was once Spondon's cemetery and there are still a number of headstones along one edge. As we get a number of queries about them, two of our volunteers - Elizabeth Kay and Liz Priestley have researched the people named on them. This has been deposited at Derby's Local Studies Library but is also accessible from Spondon Historical Society website. Spondon’s annual Social Safari will take place this year on Saturday and Sunday 7th and 8th July. As before, the “safari stops” will open at varying times so you should be able to see them all! Like last year, it will feature a scarecrow trail. We have again invited the Mayor to officially open the event on Saturday morning. These, and all the open gardens, will be detailed in the free programme, to be available nearer the time. In the meantime, keep an eye on our Facebook page. 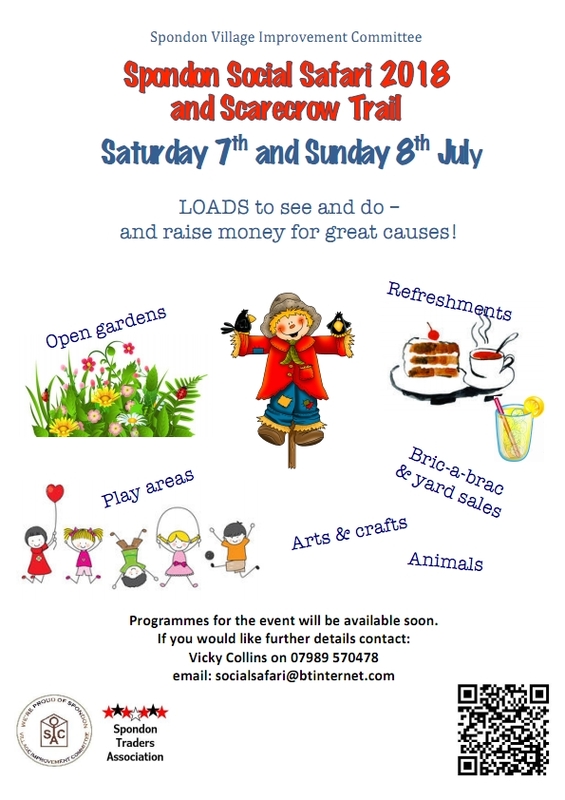 As ever, you will not be short of refreshment at the open gardens and there will be a wide variety of displays, stalls and entertainment for all ages. Participants are supporting a wide variety of good causes and will also be making a contribution to the Village Improvement Committee and Spondon Traders Association. For the first time, this event is a joint venture between the two organisations, ably led by Vicky Collins. This is a great social event in Spondon’s calendar and we hope that the weather will encourage you to get out and meet your fellow residents! The final phase of the improvements planned by the Village Improvement Committee is the installation of an information board. This was made possible by a generous donation from Severn Trent Water. The official unveiling took place on Wednesday 3rd June, performed by Peter Berry, who had lived in the old Army huts on the site in his childhood. We also heard from Jon Beeson of Severn Trent. (In the photograph, Jon Beeson is on the left, Derek Hathaway and Peter Berry behind the board. Pupils of Asterdale School, who contributed to the design, are in front of the board. The following article appeared in the May 2014 issue of SCAN. After the successful official unveiling of the toposcope in July 2013, the Village Improvement committee and City Council have continued to make improvements over the last 10 months. The final stage of the project will (funding permitting) complete this summer with the installation of an information board. Rather than a conventional text-based board, the plan is to use one with a selection of audio files, each explaining some aspect of the Park. As well as giving more capacity for information, this will be in keeping with the “tactile” toposcope, to give accessibility to those with sight impairments. The VIC funded Lynn Chambers (who worked with schools last year to produce some of the toposcope designs) for a day in Asterdale School, to provide graphic elements for the information board. Over the past few months, the Parks Department have conducted a “deep clean” (of all Spondon parks) as well as resurfacing the main path down to the southern boundary. We have also moved the “Jubilee planters” on to Dale Road itself, where we hope they will be less prone to vandalism. With the help of a Neighbourhood Board grant, the Village Improvement Committee have organised an extension to the base of the toposcope to provide some extra protection to the motifs designed by local school pupils. 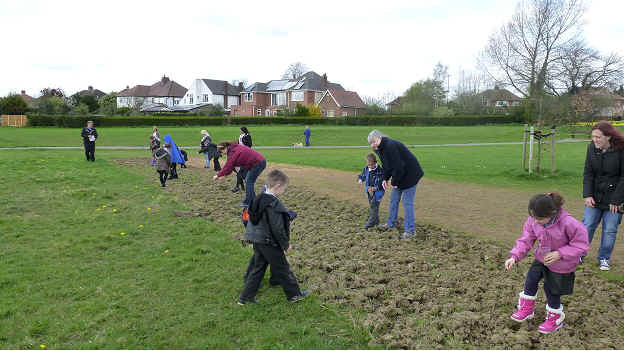 With the same grant, the Parks Department were commissioned to prepare part of the ground for sowing wildflowers. Pupils from Borrow Wood School provided the labour (as shown here). In keeping with the centenary of the start of the First World War, the flower mix includes poppies.